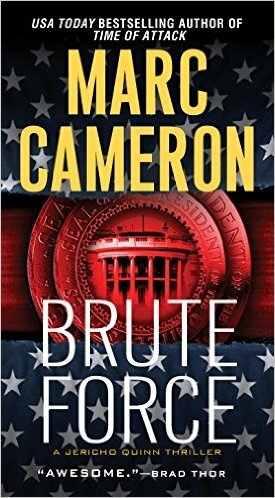 “Brute force” eBook was published in 2015 (December) and was written by Marc Cameron (http://www.marccameronbooks.com). Mr. Cameron has published six novels, all in his “Jericho Quinn” series. This is the sixth book in that series. I received a galley of this novel for review through https://www.netgalley.com. I categorize this novel as ‘R’ because it contains scenes of Violence and Mature Language. This Thriller novel is set mostly in contemporary locations in the US. The primary character is Jericho Quinn, an agent of the US Air Force Office of Special Investigations. Quinn, and long time partner US Marine Gunnery Sergeant Jacques Thibodaux, save a climbing group from terrorists. They are redirected to finding three Chinese terrorists that have escaped a Pakistani prison. They soon find that these three are on a mission to use a weapon stolen from the Chinese government against the US. Quinn and Thibodaux are operating outside the US government. In previous volumes of this series, there has been a biological attack on the US. The US presidency has been secretly taken over by middle east terrorists, and a strict police state has been implemented. A few former US officials are in hiding and working with Quinn. Now those terrorists are trying to start a war between China and the US. Their goal is the destruction of the US. Quinn and Thibodaux chase the escaped Chinese over Europe and then the US. They team up with a Chinese spy, Song, who is also on a personal mission to stop the escapees and prevent a war. The three find themselves under fire more than once. Regardless of the obstacles they encounter, they keep struggling on. This 432 page novel provided around 10 hours of reading. I had not read any of the prior novels, so some of this story line was new. It was handled well, so this was a reasonably good read as a stand-alone volume. It was very fast paced and I thought it had a reasonably good plot. I give this novel a 4.2 (rounded down to a 4) out of 5.